Last week fans were shocked at DMX’s erratic behavior during the Ruff Ryders Reunion at Barclays Center in New York . According to reports DMX just canceled upcoming shows in Santa Ana, San Diego and Los Angeles, CA. If you are not familiar with my site. I love changing my theme every now and then. I hope you enjoy the new layout. Hard Times. Chad Johnson Loses Miami Home To Foreclosure, Sold Off To Highest Bidder For ONLY $100. According to reports, Chad Johnson has lost his Miami home to foreclosure – and the pad was sold off to the highest bidder who won the auction for ONLY $100. Earlier this year, Michael Pomerantz sued Johnson demanding his Miami property be foreclosed on due to the ex-NFL star defaulting on his home loan. Watch Jennifer Hudson Performs ‘Remember Me’ On The ‘Ellen Show’. The singer delivers a soulful performance for her latest track ‘Remember Me’ on the ‘Ellen Show’. 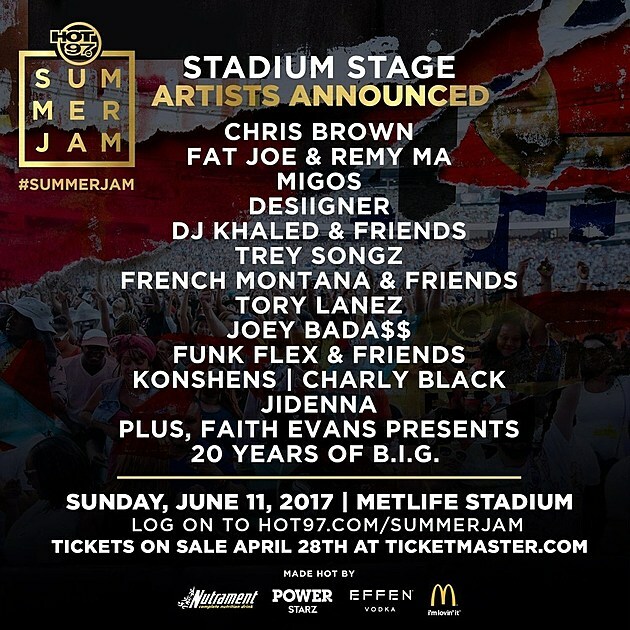 Chris Brown, Faith Evans, Desiigner, Fat Joe, Remy Ma And More Are Set To Take Over The Hot 97 Summer Jam 2017. It looks like Hot 97 is taking things another level for this year’s event. The 2017 edition of the festival will feature performances by Migos, Desiigner, Fat Joe, Remy Ma, Chris Brown, Joey Bada$$ and much more. Tickets for the 2017 Summer Jam go on sale at 12 p.m. EST this Friday (April 28) on Ticketmaster. Tickets will also be available at the MetLife Stadium Box Office beginning on May 1 at 11 a.m. EST. Caitlyn Jenner On Voting For Trump, LGBT Rights & More.